For everyone dreaming about the possibility of Space Jam returning for a sequel, it looks as though the powers that be are making some serious moves. While the Space Jam sequel has been limited to nothing but talk up to this point, a new Foot Locker video ad shows that people are serious about diving back into this franchise. This advertisement showed the Monstars rising from the ashes and becoming the world's most powerful basketball team. When a group of young men want to play some ball at their local street court, a chain had been drawn across the gate. The Monstars had locked the court, and left a sign that said anyone who wanted to play had to beat them first. The guys didn't know what to do, and ended up at a speak easy-style Foot Locker. Bugs Bunny appeared through the window to outfit them with some Foot Locker gear that could help them beat the Monstars. 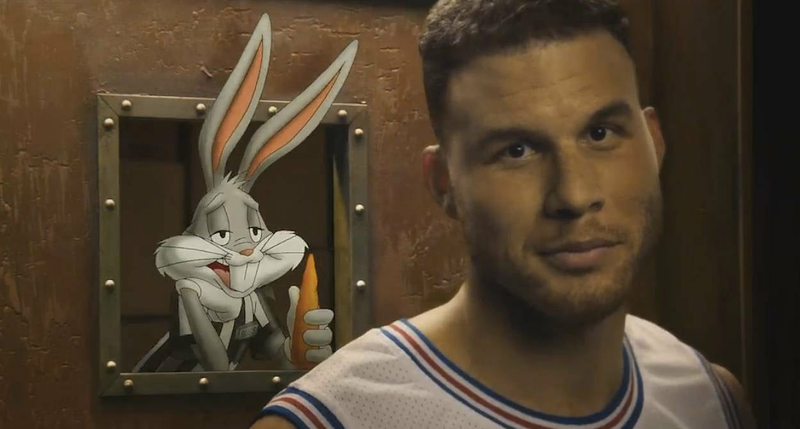 Even more, Bugs brought Blake Griffin out to help. The LA Clippers star was wearing the classic Toon Squad jersey from the original film, and decided to join the guys in their quest to beat the Monstars. Jimmy Butler, star of the Chicago Bulls, was also seen in the trailer, and he was making a bold statement to defy the Monstars. While this is only a commercial for Foot Locker, could it be signifying Butler and Griffin as stars of the new film? The Monstar rise to power could also be a plot point tease for the Space Jam sequel. Nothing official has been announced, but this video lets fans know that Space Jam is definitely far from over.